Sejarah is a journal of the Department of History, University of Malaya which was published in 1988. The publication of Sejarah was actually a continuation of the tradition of publishing journals that had been carried out by the Department of History since the 1960s. Prior to Sejarah, the Department of History had produced many journals, including The Journal of the Historical Society in 1961/62 that was replaced by Jernal Sejarah (1970/71 – 1977/78) and Jurnal Hubungan Antarabangsa (1972/73 – 1975/76) to include writings on political development and international relations as part of the syllabus of the Department. The Department did not publish any academic journal after Jernal Sejarah ceased publication in 1977/78. The Department and the Historical Society, University of Malaya, cooperated again in 1984/85 when the latter published Monograf Sejarah (No. 1 1984/85). This was followed by a period of non activity until the emergence of Sejarah in 1988. The objective of Sejarah is to provide an avenue for academics and students to write about their findings on Malaysian history and to provide platform for discussions and debates on various issues of historical relevance to Malaysia and the world. The first chief editor of this journal was Prof. J. Kathirithamby-Wells and the editorial board consist of Abdullah Zakaria Ghazali, Adnan Haji Nawang, Amarjit Kaur, Mohamad Abu Bakar and Mohd Hear Awang. Currently Sejarah is published twice in a year and include articles in both Malay and English. It accepts historical writings on Malaysia, Asia, Southeast Asia, etc. Contributions are received from within and outside Malaysia. From this year onward this journal is published online and can be accessed in e-journal.um.edu.my. Sejarah is committed in upholding the integrity of research in history. We strongly encourage authors to refer and adhere to the following ethical considerations. Sejarah takes the issue of plagiarism, copyright infringement, related forms of wrongful appropriation and other breach of journalistic ethics in publication very seriously. In order to protect the right of our authors and fellow researchers in the field, we pay significant attention to identify plagiaristic attempts including literal/substantial/limited copying, paraphrasing and duplicate submission. If an article is found to have plagiarized by using another’s published or unpublished work, including theories, concepts, sources, methodologies and findings, as well as graphical representations such as graphs and images, without or with insufficient acknowledgment, we reserve the right to decline the submission and take appropriate action. To ensure a smooth manuscript review process, authors should be able to produce original papers and must appropriately cite and quote the work and words of others. If a manuscript has been previously published it is not usually accepted for publication in Sejarah. Nevertheless, we do consider publication of certain materials under special circumstances. Importantly, the reproduction or publication of materials already published elsewhere is strictly subject to approval and permission of the previous publisher/original author/keeper. Authors should observe the value of integrity by citing primary sources only if these have been actually seen and used. These include facts, arguments, summaries, figures, statistics, etc. In the case when the author uses the interpretation of a particular primary source from a secondary source, it is appropriate to cite the secondary source. However, authors may choose to cite both secondary and primary (again, if the primary has been actually seen) if it is felt that the argument relies on the acknowledgment of both. When reporting findings using the method of oral history, authors should bear in mind not to disclose private information and any particulars strictly deemed confidential by the interviewee. As for the usage of digital archive, it is advised that authors cite the reference source together with a proper acknowledgment for the online provider. Authors may not need to strictly observe the aforesaid in the case using sources generated by Google Books and Google Scholar. The Sejarah editorial board will ensure that articles are sent for review to editors and recognized experts within the field. This is to guarantee the quality of feedbacks for amendments and the review process itself. The journal practice double-blind review, which means the identities of both the reviewer and author are concealed from the reviewers, and vice versa, throughout the review process. Individuals who have made significant contribution to the actual research and writing of an article should be named as an author and co-author. Those who are deemed to have only participated in specific aspects of the research and writing of the article may be named as contributors. If authors request removal or addition of an author after submission or during any particular stage of the review process or following publication, Sejarah editors reserve the right to seek an explanation. In the case that an article is co-authored by an academic supervisor and a post-graduate student, the latter should be named as the corresponding author and take responsibility for communication with the journal during manuscript submission, review and publication process. Nevertheless, we recommended copies of all correspondence be sent to individual authors. 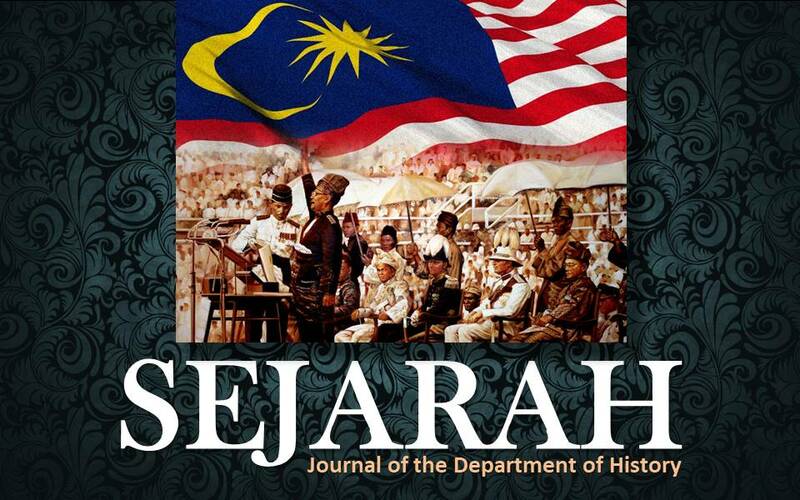 Sejarah is freely available online for authors and students to view and download. Users should agree with the general open access policy on the unrestricted access and practice integrity, as stated in "3" when citing/quoting/referencing all materials published in this system.